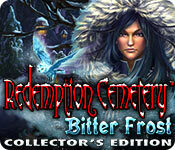 Redemption Cemetery: Bitter Frost Collector's Edition is rated 3.4 out of 5 by 61. Rated 5 out of 5 by LADY_BLADE from BEST ONE YET... Promises to be the best Redemption Cemetery yet. It immediately grabs your attention with the first cut scene and it gets better from there. 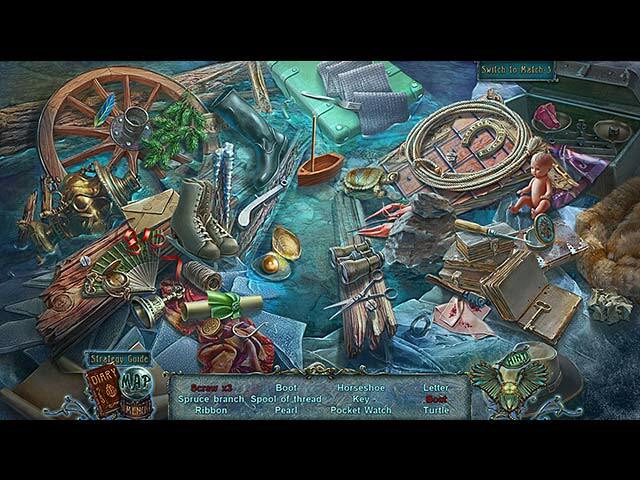 Find out the history of the freeze as you go back in time to save your ancestors (so you can be born). Collect snowflakes along the way. 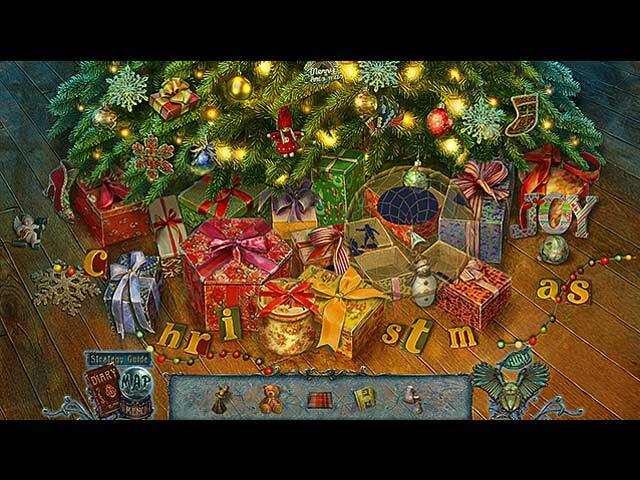 Nice spread out and colorful HOS, followed by a "put-it-together" puzzle with winter and Christmas themes. In your journey, you do have the help of your first ancestor who gave up the spirit world to be with his human love, starting your ancestry line. You also have the help of a feather which enlarges things (so that a simple scissors, for example, can become a garden shears and perform useful tasks). The animation and special effects are superb and the voice overs are professional and portray the reality of the situations (no flat tones here). This is a well-detailed and thought out game that is an immediate must-buy!!! Rated 5 out of 5 by jumisa from Redemption Cemetery Bitter Frost Collector's Edition I thought this was beautiful. The graphics were so clear, they didn't have a million puzzles one after the other. The HOS were bright and easy to see. (some of the games have too many, one in each scene and they're dark) I wished there had been 2 bonus games, I enjoyed the game very much. Rated 5 out of 5 by jcsgame from ENJOYABLE GAME I thoroughly enjoyed playing this game. I liked the way it was divided into segments. The graphics were beautiful. The bonus game, to me was like a Christmas Present. I never once used the "jump map". The flow of the game was perfect, that the "jump map" was not needed. The story was unique also, in the fact that you had to save your Ancestors in order to survive yourself. I rate this as one of the best Redemption games that has been developed. Rated 5 out of 5 by LisaP49 from A very good holiday hog I really enjoyed this game since it didn't have a lot of horror in it and it was based on a normal feeling.Some of the games lately are so far out of reality that I don't enjoy them but this was really great.It had good graphics, a good story line,and a map to jump around where you needed to do things.This was worth the money and I do recommend. Rated 5 out of 5 by blueteal44 from Don't be put off by low stars This game is worth the stars I don't see why some people gave it such a bad rap.I have played all the other games in the series and in mho I found it fitted in really well with the series.Don't be put off by a few people who did not like it,I nearly did but am glad that I played it to the end. 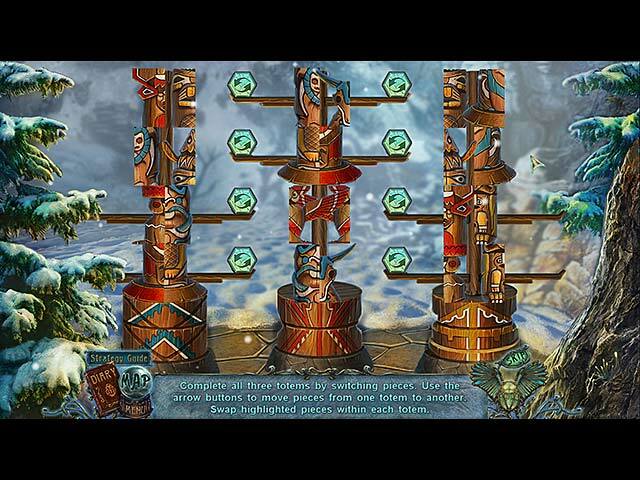 Rated 5 out of 5 by possumb from Ancestral Challenge Koturi, your ancestor comes to you for help. An evil frosting entity is trying to kill your fore fathers - so you may not exists at all - scary thought. So, in you jump into this adventure by Ers - boots and all. Love the cut scenes and the voiceovers -excellent. A quality game with little extras which will delight you and perhaps scare you as well. Rated 5 out of 5 by Smi87 from Love it!! I absolutely love ERS games!! This game is another great one !! Rated 5 out of 5 by MSBAM100 from Save your ancestors and save yourself! This is the 5th game in the series and it doesn't disappoint. You still have portals to go through and save some innocent soul from a disaster. Only this time, it's your ancestors, and if you don't save them, you won't be born! Your ancestor Koturi, the Owl Spirit - hence the owl flying around the game - gave up being immortal to marry Sheenah, his true love, instead of Wenonah, the Spirit of Cold. So Wenonah's a bit peeved and decides to wipe out all of Koturi's descendants. Koturi appeals to you to save your bloodline. The first save is your grandmother, whom Wenonah is about to lure into jumping off the roof. But then the demo ends! Of course, everything is covered with snow and ice by Wenonah! You have four modes of play including custom. The extras include the Bonus scenario, wallpaper, art, screen savers, movies, music, mini-games and the HOS. You get a Strategy Guide - not needed yet - and a diary, an interactive map, locking inventory, and a hint button that points to where to go instead of taking you there. You can collect snowflakes that will buy items for fixing up your house in the collections room. The achievement awards appropriately represent a Christmas dinner - since the game takes place on Christmas eve. You also get a feather that you use to enlarge items -- hard to decide when to use it but it gives you a hint! I am assuming you have to rescue at least three relatives or so, going back through different portals, which is how the previous games worked. Another fine game from our ERS friends to keep us busy during the holidays!